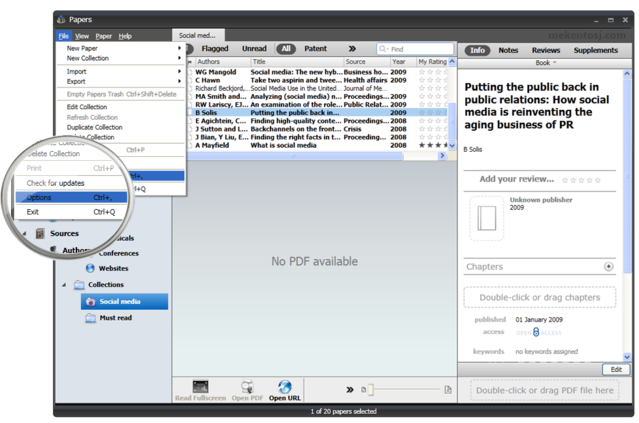 Manuscripts is the revolutionary citation tool included in Papers. You can search and cite literature directly from your Papers library when writing -- in almost any application! We hope that once you've started using Manuscripts, you've never had as much fun when writing a paper. Beside copying citations to the clipboard, Manuscripts supports formatting citations and bibliographies with popular word processors such as Word. You can even add citations in other programs, such as PowerPoint, Excel, and even in Internet Explorer. You can set your favorite citation style. The citation style can still be changed before you format your manuscripts, but your favorite will be your default citation style. By turning on Manuscripts, you can use the ctrl + alt +p keyboard shortcut to insert a citation.